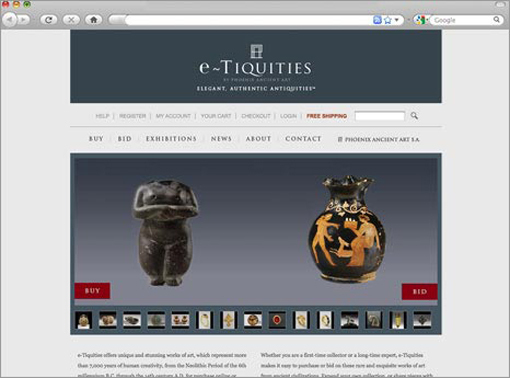 e~Tiquities is an online e-commerce and auction site where anyone can buy or bid on objects older than Jesus. The site is the brain child of Phoenix Ancient Art, a trusted antiquities dealer who sells to museums and high-end collectors. Wanting to make antiquities more accessible, they approached Studio K&M with the idea of creating an e-commerce and auction site where the average Joe could purchase affordable antiquities on the web, including a 12,000 year-old plate. We incorporated advanced zooming technology that allows buyers to zoom in very, very, very, very close to reassure them of exactly what they were purchasing. And, oh, did we mention that we came up with the name as well?